Spend Friday morning reading through and perfecting all your documents. 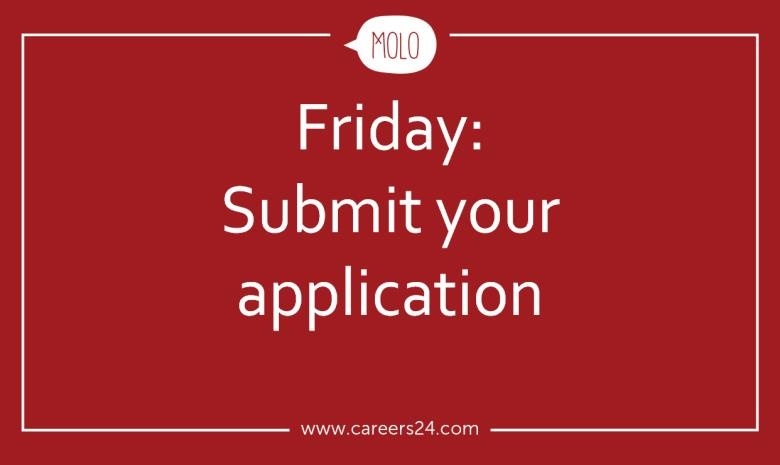 The final stage of your job application process is extremely important. This is where the silly mistakes can easily creep up. Therefore, to avoid any where-did-that-come-from surprises, spend Friday morning ensuring any potential danger areas are prevented. Begin by proofreading your CV and cover letter over and over again. The importance of reading through all your documents more than once cannot be stressed enough. Run a spellcheck on all your documents, print them out, read them out loud, get someone else to read them. Basically do whatever is necessary to make sure everything is in the best possible standard. Next, read over the recruiter’s instructions. Did the recruiter specify that you send your application via the “Apply” button or via direct email? Are there any attachments you need to add to your application? These are examples of the small details you need to look out for before sending your job application. Ensuring that you follow all the instructions the recruiter specifies is a already an opportunity to prove your worth to the recruiter. Once you’ve thoroughly gone through your CV and cover letter and followed all the recruiter’s instructions, you’re ready to submit your application. A short introductory email that briefly shows your suitability and enthusiasm for the job will be enough. Again, remember to proofread the email – a perfect CV and cover letter may never be read if you have an error in the email. Thereafter, it’s time to hit the “Send” button.